Physicians in Haiti face a new set of challenges as they stem the spread of infectious diseases and restore medical care to a country that had little before a devastating earthquake struck. Providers and administrators of retail medical clinics try to assess the evidence base behind the care delivered at these facilities. Office-based practitioners ignore the increasing number and expanding capabilities of storefront medicine clinics at their peril. Programs in quality and patient safety initiatives have come to the fore as graduate-level degrees, adding prestige to a new body of knowledge that has emerged in the past decade. The idea is evolving that improving transitions of care from hospital to outpatient settings reduces readmissions. From medication lists to tracking labs to missed referrals that delay diagnosis, an expert in the field considers it all. A primary care internist with a background in hospital medicine, hospice care and psychiatry explains how he grew an inpatient consult service to include outpatient services, home services and research programs. 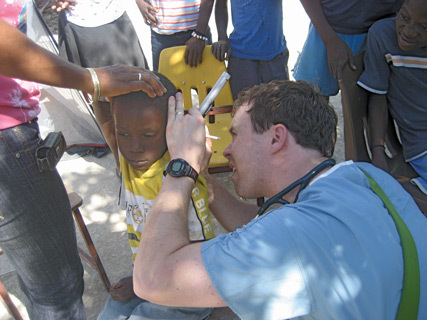 Internists help pick up the pieces in Haiti, a country facing a public health crisis following a devastating earthquake. Diagnosis, lab tests and management make up the three key considerations when coding for anticoagulation management through Medicare. An expert sorts out the issues and scenarios for a variety of scenarios. Joseph E. Johnson III, MACP. ACP presented Evergreen Awards to 10 chapters at Internal Medicine 2010. The Evergreen Program provides recognition and visibility to chapters that have successfully implemented programs to increase membership, improve communication, increase member involvement, enhance diversity, foster careers in internal medicine and improve management of the chapter. A 35-year-old man is evaluated for red eye and acute onset of right eye pain. He wears contact lenses daily. Fluorescein staining is positive for corneal abrasion without a dendritic, or branching pattern. He is instructed to stop wearing the contact lens until the abrasion is healed. He calls the next day to report that the pain has worsened, even though he has not worn his contact lenses. What is the most likely diagnosis?.